Community Support Services (CSS) is a not-for-profit organization supporting to people with intellectual/developmental disabilities. CSS provides services in 57 communities in western Cook and Eastern DuPage counties. CSS is seeking applicants for Direct Support Professional positions in various communities. This Saturday, Nov. 23rd, CSS will host a job fair at their facility, 5416 W. 25th St., from 10a.m., to 2p.m. CSS matches the needs of the people they serve with your strengths and interests. CSS offers a wide variety of flexible hours, primarily evenings and weekends. 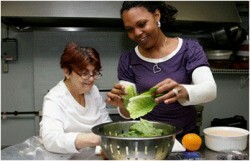 To learn more about the work of a Direct Support Professional, visit www.CSSservices.org.